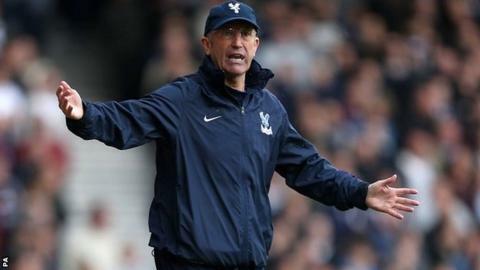 Crystal Palace boss Tony Pulis has been awarded the Barclays Manager of the Month award for April. The 56-year-old guided Palace to four wins from five league games as the Eagles climbed out of relegation danger and into 11th place. Sunderland striker Connor Wickham was named Player of the Month. The 21-year-old scored five times to take his team out of the drop zone, with key strikes against title contenders Manchester City and Chelsea. Palace were relegated in all four of their previous Premier League seasons and were in the bottom two when former Stoke boss Pulis replaced Ian Holloway at Selhurst Park in November. Wickham, who joined the Black Cats from Ipswich in 2011, scored a brace against City in a 2-2 draw at the Etihad Stadium.